Download all Mobile flash tool latest version 2018 here. To flash smartphone you need to use flash tool to flash/download firmware to the phone. Here we provides latest version of flash tool for MediaTek (MTK), Spreadtrum (SPD) and Qualcomm chip-set based Android smartphone. These flash tools are free and easy to flash or download or upgrade firmware of the phone. MediaTek flash tool or it's called Smart Phone flash tool in short it's called SP Flash Tool, by using this tool you can flash all most all MTK based Android smartphones. Spreadtrum flash tool has tow different version of flash tool one is Upgrade Download Tool and the other one is Research Download Tool. To flash Qualcomm based smartphone you can use Qualcomm Flash Image Loader or so called QFIL Tool, it also has two different tool one is QFIL Flash Tool and another one is Qualcomm Product Support Tool or so called QPST Tool. 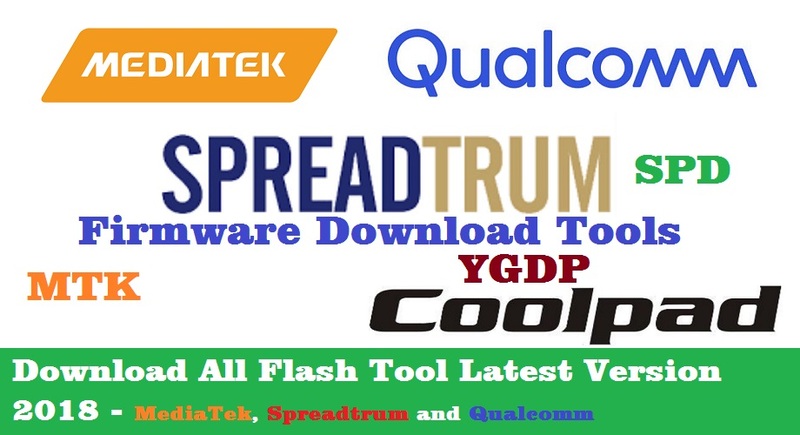 Along with these flash tool one more flash tool is very important which can flash .CPB firmware files called YGDP Flash Tool and it supports all the platform such as MediaTek, Qualcomm and Spreadtrum Chipset phones. Please go through this topic to know how to use these Mobile flash tools and download the latest version of Mobile flash tools here. The SP Flash Tool (Smart Phone Flash Tool) is used for flashing, downloading, upgrading and Unlocking Android smartphones runs on MediaTek or MTK Chipset platform. This is a small flash tool comes with zip file and you do not need to install this on your Computer, to use this tool just download and extract it and run SP Flash Tool .exe file directly from the folder. To flash firmware using this tool is very easy, just download any MTK firmware and extract it, then open SP Flash Tool, then load the Scatter.txt file and flash the phone. Download SP Flash Tool Latest version from the below link. This tool is specially used for flashing, Upgrading and Unlocking Android smartphones having Spreadtrum Chipset. This flash tool supports .PAC file format, so flash using this tool you need to download SPD flash file and use the Firmware.PAC file with this flash tool and flash the phone. As I said before there are two different version of this flash tool, in some cases if the flashing failed with SPD Upgrade Flash Tool then you can try the SPD Research Download Tool and you will success with that. Download SPD Flash Tool latest version from the below link. This tool can be used on Qualcomm Chipset based Android smartphones to flash firmware or Official ROM. The YGDP flash tool can be used for flashing MediaTek, Qualcomm and Spreadtrum Chipset based Android smartphones. Yes this flash tool can download/upgrade/flash firmware into these chipset based phones. This flash tool works on some particular MediaTek phones and in that case SP Flash tool can't flash the phone for example Micromax Canvas Nitro A311 which MediaTek MT6592 chipset, can be flash with YGDP Flash Tool using Micromax A311 CPB firmware. So these are the most useful flash tools you must have to flash various Android smartphones, having Qualcomm, MediaTek and Spreadtrum Chip-set. Download these free Mobile flash tools latest version 2018 and flash your Android smartphones for free.